What is the pre-release channel? The pre-release channel is a way for customers to gain access to products that are at an “alpha” or “beta” stage of release. We’ve created this channel so that we can get feedback from customers on these products/releases and make sure any bugs we’ve missed are caught before we upgrade the code to our stable channel. The pre-release channel is also a GREAT way for our customers to discover new features that are coming in future releases and to provide feedback on their implementation and understand how they will affect their current usage of the Event Espresso family of products. What the pre-release channel is not! The pre-release channel contains products that are close to a stable version but are not recommended for use on a production server. More than likely, there will be bugs still existing in versions of plugins/add-ons pushed out via this channel and we are grateful for the bug reports that come in for users who do test these version as it helps ensure a far better product once we upgrade the product and release it as a stable version. Use pre-release add ons on a live production server at your own risk. When you check this box there will be a popup appear that gives you some instructions that you are agreeing to when you click the “I Agree – Sign Me Up!” button. After clicking the “I Agree – Sign Me Up” button, the page will reload and you will see a new box below your Download’s box that shows all the pre-release products you have access to. Congratulations, you are now a part of the pre-release channel! Remember, we HIGHLY advise you only use pre-release channel products on a development or staging server. Do NOT use them on a production server. A good thing to do in testing is to migrate your database from a production server to your staging/development server so you can test with the same data on live. This will more accurately reproduce real world use and you can spot bugs that would appear if the product was on your live server. The document link in the pre-release channel box points to the dedicated forum for that pre-release product and we ask that all bug reports be posted in the appropriate forum. That way we can be sure that our developers get the info they need. Please search through any existing topics in that forum to see if your bug is already posted and then post there if you have new information to report. Post new topics if there isn’t already a report for your issue. We ONLY fix bugs on pre-release versions. Please do not request any new features for pre-release products. When we push out a pre-release product we have put a feature-freeze on that product so we can focus on fixing bugs and getting it to our customers as a stable product. Automatic updates WILL work with pre-release products and there may be times where we release updates to those products before they reach a stable version Make sure you are using the latest pre-release version of the product when you are testing (you can see notifications on your WordPress plugins page). To enable automatic updates, you need to use your license key found on your user profile. Note: We’ve removed the domain restrictions for pre-release products using your license key. So it is possible to have multiple copies of the pre-release product on multiple domains without experiencing any license key issues. However, if you try to install a stable version of the product on multiple domains you will still experience the normal multiple domains restriction message. How come I’m not seeing a product I know someone else has access to in the pre-release channel? 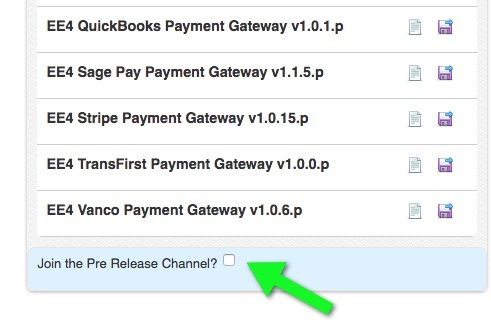 The pre-release channel products you have access to are tied to a stable product you have access to. So, for instance, if we have a pre-release version of the Seating Chart Add-on available but you don’t have access to the current stable release of Seating Chart Add-on then you won’t have access to the pre-release version.